Wednesday, April 10th, from 7-9 PM, at The JCC of Greater Ann Arbor. This discussion will provide several viewpoints on the growing epidemic of Human Trafficking in Michigan, including the perspective of Deborah Monroe, a survivor, and Edee Franklin, the founder of Sanctum House, the first long-term safe home in Southeastern Michigan for adult survivors of Human Trafficking. Franklin founded Sanctum Home after sponsoring women in addiction recovery and witnessing the significant need adult victims had around receiving safe housing and trauma-informed care. 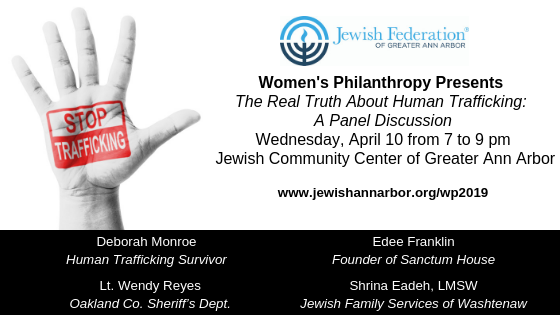 Lt. Wendy Reyes of the Oakland County Sheriff’s Department and Shrina Eadeh, LMSW, of Jewish Family Services of Washtenaw County will be rounding out the panel and will share how law enforcement and nonprofits are working to help victims. A dessert reception will follow the discussion. The event is $18 to attend, and guests are asked to make a $100 pledge to the 2019 Annual Community Campaign, if they have not yet pledged. For more information or to register, please visit www.jewishannarbor.org/wp2019 or call 734-677-0100 ext 245.